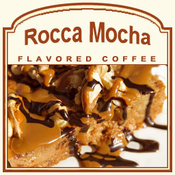 Rocca Mocha flavored coffee is a collection of rich flavors that features roasted pecans, creamy, smooth caramel, hearty maple syrup, and decadent Swiss Chocolate. Made with 100% Arabica beans, this flavored coffee features buttery undertones of pecans that mesh exceptionally well with the maple syrup and chocolate overtones. Perfect for those that love chocolate and pecans, Rocca Mocha is decadently rich. Packaged in a heat-sealed valve bag, this Rocca Mocha will be roasted and shipped on the same day. Flavorful and sweet, this Rocca Mocha flavored coffee will offer your taste buds a truly sweet collaboration of pecan-chocolate flavors. This flavored coffee contains nut extract.